Is there anything worse than dealing with acne? We didn’t think so either… Acne is embarrassing, frustrating, ugly and can damage self esteem. You’ve tried more face washes and expensive creams and oils than you can imagine. Even if you seem to get acne under control for a time, it always seems to come back, seemingly worse and even more intense than before—and always right before a big event, such as a wedding or job interview. If you are a teenager and are suffering with persistent acne, you probably long for the days when you reach adulthood, which will put an end to your awkward acne prone days, right? Many adults—both men and women—suffer with adult acne well into their adult years. In fact, according to clinical studies performed by the International Dermal Institute, 40 to 55 percent of adult men and women between the ages of 20 and 40 suffer with adult acne. Furthermore, studies also show that adult acne is actually increasing. But why? Research shows that adulthood acne is more likely to be inflammatory with acne spots, cystic acne, and blemishes appearing around the mouth, chin, and jawline. Additionally, many adults suffering with acne also experience other types of skin conditions, which can make it more difficult to treat and pinpoint the exact cause for acne. Now that we have gotten the bad news out of the way, it’s time for the good news… The good news is acne is entirely treatable, even if you are at your wit’s end are ready to give up all hope for clean, clear, and beautiful skin. In this article, we will review the best skin treatments for oily skin and the best face wash for acne, so you no longer have to waste time and your hard-earned money trying expensive acne spot treatments and skin care products that don’t work. However, before we dive into our list, it’s important to first understand exactly what acne is, how and why it occurs as well as the different skin types. Having this knowledge and information upfront will help you to determine which acne treatment is best for you. You may be familiar with the different skin types, such as normal, oily, dry or a combination of the three. Some people also have sensitive skin, more so than others. How do you know which skin type you have? Additionally, your skin type can actually change over time. For example, teenagers and young adults are more likely to have a “normal” skin type than their elders. All in all, your skin type ultimately depends on the moisture levels in your skin, which can affect its elasticity, the level of oils present in the skin, and its level of sensitivity. Normal Skin – Normal skin is described as having little to no imperfections and little sensitivity. The pores are barely visible and skin looks bright and radiant. Oily Skin – Oily skin typically has enlarged, visible pores as well as a shiny, thick complexion. With the presence of excess oil, skin blemishes, including blackheads, pimples are typically more visible when compared with other skin types. Combination Skin – A combination of normal, dry, and oily skin is one of the most common skin types, particularly among adults. This means that some areas of your skin are oilier than others. For example, your T-zone (nose, forehand, and chin) are typically where oil is present. A combination skin type can include having larger-than-normal pores, visible blackheads, cystic acne and shiny skin. Sensitive Skin – Although many people claim they have sensitive skin, this skin type is often misunderstood. Having sensitive skin doesn’t necessarily mean you break out easily; rather, it means that you often experience reactions on your skin, such as blotches, patches of redness, rashes or bumps. Sensitive skin also experiences skin flushing and blushing on a regular basis. Dry Skin -Dry skin is another common skin type. If you have dry skin, then you likely suffer from visible red patches, more visible lines, cracked or peeling skin and itchy and irritated skin. Dry skin can become so severe that it can actually become painful and it can spread throughout the arms and legs. Aging Skin – Aging skin affects men and women after the age of 30. This is because collagen production reduces by 1 to 2 percent each year after the age of 30, which means more fine lines, wrinkles, and sagging skin becomes more visible and apparent. All in all, determining your skin type first will allow you to understand why you are prone to acne breakouts and how to treat them with the best skin care products once and for all. Believe it or not, acne is actually classified as a disease. Acne is a disease that affects the oil glands in the skin. Those small holes in your skin are known as pores, and they connect to the oil glands through follicles just beneath the skin’s surface. The job of your skin’s glands is to produce oil that carries dead skin cells to the surface of the skin. When the follicles of a skin gland clogs up, a pimple grows. Although acne is not a serious health threat by any means, it can cause severe skin scarring. As mentioned briefly above, skin cells and oils produced by the skin’s glands can clog pores. The bacteria that grows from clogged pores then causes swelling, or pimples. Whiteheads. These are pimples that remain beneath the skin’s surface, but a small white bump appears. Blackheads. These pimples rise to the skin’s surface and look black. Papules. These are small, pink bumps that don’t break the skin, but can feel sore and tender. Pustules. These pimples are red at the bottom and have pus on top; hence “pus” in the name. Nodules. These are large, solid pimples that are deep in the skin, and are often incredibly sore and painful. Cysts. These deep, pus-filled pimples are often incredibly painful and are the most likely to result in serious scarring and “pitting” (or dents) in the skin, leaving skin looking uneven and rough. Remember that you are not alone. There are many causes of acne. In fact, there are so many causes of acne that many dermatologists struggle to pinpoint the exact root cause. Hormonal Changes – Hormonal changes are the most common cause of acne in women. Women of all ages are likely experience to breakouts during their menstrual cycles, starting and stopping birth control pills, adolescence and puberty and even during pregnancy. Genetics – Unfortunately, if your parents or other members of your family have suffered with acne, then you are likely to as well. Various Medications – A number of medications can cause acne breakouts. For example, medications that are used to treat anxiety, depression, bipolar disorder and other mental disorders and illnesses contain lithium, which is known to cause acne. Steroids are another medication and drug that are infamous for causing acne breakouts. Greasy Foods – Many people and researchers believe that consuming greasy foods causes acne is a myth. Some researchers believe it does, whereas other studies have not confirmed or denied the consumption of greasy foods is a direct cause of acne. Dehydration – Although dehydration doesn’t cause acne directly, it can affect your skin. Take care of your skin and drink a sufficient amount of water each day will not only reduce the appearance of patchy red spots and blotches, it will also restore color to your complexion. Buildup of dirt, oil, and makeup – Perhaps the most obvious cause of acne is a buildup of dirt, oil, and makeup. Think about all the places you travel to and what your skin is exposed to on a daily basis. Take care of your skin and be sure to wash your face every day. Using a face wash cleanser, pore cleanser, astringent or another type of trusted skin care product can help keep your skin clean and clear. Ladies, one of the worst things you can do to your face is leave your makeup on when you go to bed. Makeup clogs the pores and holds in excess oil, leaving your skin prone to acne breakouts. Do yourself—and your skin—a favor and thoroughly remove your makeup before you go to bed. If you suffer with acne, then you probably feel like you are the only one in the world. However, as we have explored above, acne is the most common skin disease that affects more than just teenagers; acne affects people of all ages. Although the most common age group that suffers with acne is between the teenage and young adult years, 80 percent of people between the ages of 11 and 30 suffer with acne at one point during this time. In fact, some adults in their 40s and 50s still struggle with acne. Is There a Cure or Relief for Acne that Actually Works? If you are beyond frustrated with trying various face washes, creams, astringents or topicals that just don’t seem to be a match for your acne, you might wonder if there is a cure or treatment for acne that works for you at all! The good news is that there are cures and treatment methods for acne—some of which can be costly whereas others come with a minimal cost. However, determining the best acne treatment for you depends on the type of acne you have. It’s also important to try to be patient. Acne cures and treatments can take time regardless of your age or if you are treating mild or severe acne, including cystic acne. However, getting the right type of treatment will prevent severe scarring or future scarring. Generally, the more severe acne you suffer with, the more likely you are to suffer with scars and the ugly aftermath after acne is treated and under control. Here are some options of the different types of acne cures as well as their costs. 1. A Trip to the Dermatologist: If you are tired of suffering with acne, then it might finally be time to take a trip to a dermatologist, if you haven’t already. A dermatologist that specializes in skin conditions and diseases, including acne will be able to accurately and fully diagnose acne as well as have access to treatment options and cures, such as antibiotics or super strong medications made to specifically treat and cure acne breakouts. 2. Antibiotics: Because acne is a skin disease, it is often treated with antibiotics, such as doxycycline, tetracycline, minocycline or erythromycin. These types of antibiotics help kill the bacteria that causes inflammation and swelling around the blocked pores, reducing the appearance and breakouts. Although many antibiotics are effective in treating acne, they don’t always cure it for good. Additionally, antibiotics can also cause a number of side effects, such as rashes, allergic reactions, nausea and/ or vomiting, dryness in the skin, a variety of infections (such as urinary tract infections and yeast infections in women) and a host of other issues. Each person reacts to antibiotics differently, so it’s important to consider these factors before selecting an antibiotic to help treat acne. In fact, studies have shown that using products that contain benzoyl peroxide, salicylic acid, and glycolic acid can help reduce antibiotic resistance while also combat against acne. 3. Topicals and Ointments: In addition to antibiotics, dermatologists can also prescribe stronger medications, such as topicals, creams, and ointments that individuals can’t get over the counter. One such topical is Finacea. Finacea is available as a foam as well as a topical, and contains up to 15 percent of azelaic acid, which is the main, active ingredient for treating acne. Some common reactions and side effects from using Finacea include itching, burning, tingling and dryness. Finacea requires a prescription from a healthcare physician or dermatologist to purchase. 4. Green Tea: For those individuals who prefer to try a more natural method to treating acne, many have found green tea products to be just as effective if not more effective than medications and other skin care products and pore cleansers. In fact, studies have shown that the combination of green tea and lotus could help individuals regulate excess oils in the skin and help treat skin disorders and diseases. Drinking green tea or purchasing a green tea supplement can help treat skin diseases, including acne. 5. Tea Tree: Another natural, at-home remedy for treating acne is tea tree oil. In fact, numerous studies have shown tea tree to have a number of powerful benefits, including restoring health and strength in the hair and skin, in addition to treating acne. Tea tree oil is actually found in a number of skin products today. Studies have also shown that tea tree oil is just as effective as benzoyl peroxide, one of the chemical solutions we have explored to help treat acne. By simply mixing pure tea tree essential oil with some raw honey, you can easily make your own facial cleanser and pore cleanser right at home. 6. Dermabrasion: This particular procedure is typically used for individuals with severe acne scarring. The process basically involves sanding down the surface of the skin with a rotating brush, which helps blend scars into the skin for a smoother appearance. 7. Chemical Peel: Although this seems like an expensive and luxurious treatment method offered by high-end salons or spas, it is actually a preferred acne treatment method by many. This procedure applies salicylic acid, a chemical solution used to treat and cure acne. This treatment method combined with other treatments is very effective. However, it is not recommended to combine this treatment with taking oral medications as this can cause to skin irritation. 8. Laser Resurfacing: Similar to dermabrasion, this is another skin resurfacing procedure that smoothes the appearance of the skin and reduces the appearance of acne scars with a laser. 9. Light Therapy: This treatment involves the use of lasers, which produce a series of pulsating lights. The lasers heat the skin and can stimulate new skin growth, reduce the appearance of scars, and also target bacteria that causes acne and inflammation. Depending on the level of severity, several treatment sessions may be needed in order to make acne scars less noticeable. This treatment is preferred by many as it typically involves a shorter recovery period and less downtime. 10. Skin Surgery: This procedure involves a surgeon physically cutting out and removing individual acne scars and repairing the holes in the skin with stitches or skin grafts. Women are more likely to suffer from acne well into adulthood than men. This is because women go through various periods of hormonal imbalances, such as pregnancy and menopause. Additionally, every monthly menstrual cycle can cause acne breakouts. All in all, hormonal changes and hormonal imbalances can cause acne. The majority of women who suffer from “hormonal acne” take oral contraceptives or other medications to help them regulate hormones and acne. In fact, some oral contraceptives are designed specifically for the treatment of acne caused by hormonal changes from menstrual cycles. Some examples are Yaz, Estrostep, and Ortho Tri-Cyclen. Research has shown that oral contraceptives that have a balance of estrogen, progesterone, and progestin can help stabilize hormonal changes in order to prevent the severity of PMS symptoms as well as acne breakouts. Most physicians and dermatologists that prescribe oral contraceptives to women for the treatment of acne recommend consistent and regular usage for up to three months to see full effects. Isotretinoin is another acne treatment method specifically designed for women who suffer from hormonal acne. However, this treatment method is typically reserved for those with severe acne and for those who did not successfully respond to other acne treatments. Although Isotretinoin has proven to be very effective for some, studies have shown that in 15 to 30 percent of cases, acne has returned. Additionally, the potential side effects and risks to taking Isotretinoin can be severe. The risks and side effects include upset stomach and stomach conditions, such as ulcerative colitis, bone and joint pain, and severe depression. Additionally, two forms of birth control are recommended for women who take Isotretinoin. Women are also required to participate in an FDA-approved monitoring program to receive a prescription for Isotretinoin. The program also requires women to submit at least two pregnancy tests prior to taking the drug. Although men are less likely to suffer from severe acne during adulthood, some men continue to struggle with keeping acne under control, particularly those who spend a lot of time at the gym. In fact, it has been reported that 17 million adults in the United States suffer with acne, 25 percent of which are men. However, most men can control acne by using face washes or other products that contain benzoyl peroxide, which as we explored above, can help destroy bacteria that seeps into follicles and triggers infections. Salicylic acid is another chemical solution that helps unclog pores. Most men can help treat and cure acne with over-the-counter products. But which acne wash products are best used to help treat acne? Although you may have tried a number of products, or if you are currently researching to determine the best acne treatment product for you, we have compiled a list of the best acne face washes for oily skin, the best acne cleansers as well as pore cleansers, and also the best soaps for acne and oily skin. Cleanses Skin and Helps Prevent Breakouts. With Conditioners and Salicylic Acid Acne Medicine. Microclear Technology Helps Boost Delivery of Acne Medicine. Helps Treat Acne Even Before It Emerges. Neutrogena Oil-Free Acne Wash – This product is one of the best acne wash products for oily skin. It is an oil-free product, which not only works to treat existing acne but also helps keep skin clean and dry, preventing future breakouts. 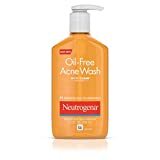 Neutrogena oil-free acne face wash is also recommended by many dermatologists as it contains salicylic acid acne medicine, which helps to deep clean skin and pores treating existing acne and preventing new acne from emerging. This product can be purchased online or over-the-counter in department stores for approximately $10 to $20. Clean and Clear Control Cleanser – Clean and Clear is a popular and well-known brand that offers a wide range of acne fighting and acne treatment products designed for different skin types and for different levels of acne breakouts. However, one of the top-rated cleansers is the Morning Burst Shine Control facial cleanser. This product is designed for normal, oily, and combination skin types. It helps remove dirt, oil, and dead skin cells, helping to keep skin dry, smooth, and clean all day. This product is also completely safe, containing lemongrass, fruit extracts, and even hazel, which help to keep oil under control. This Clean and Clear cleanser can be purchased online or in stores for approximately $5 to $10. Launched by The Design House of Cataphyll. This Antibacterial Bar is a Non-Soap Formulation. Its Designed Especially For Cleansing Dry, Sensitive Skin. Provides Gentle Cleansing With Deodeoderant Benefits. Mild, Non-Soap Formula For Facial And Full Body Cleansing. Cetaphil Antibacterial Gentle Cleansing Bar – Cetaphil is another dermatologist and doctor-recommended product for treating acne. This soap for acne and oily skin can be used on the face and body, making it a great option for those who suffer from acne on the shoulders and back as well as the face. This product can help treat acne-prone skin and also be used as a facial cleanser. Additionally, this antibacterial bar soap is less potent compared to some other antibacterial soaps. This is because it is designed specifically for dry or sensitive skin. It gently cleanses the skin and won’t clog pores or cause any skin dryness or irritation. The Cetaphil antibacterial cleansing soap for acne and oily skin can be purchased online or in stores for approximately $10 to $20. Clears Acne Blemishes on The Body. Unclogs Pores to Clear And Help Prevent Future Breakouts. Dissolves Impurities to Help Purify The Appearance of Pores. Gentle Beads Exfoliate Dull, Dead Skin Cells. Designed to Leave Skin Feeling Refreshed. Proactiv Deep Cleansing Wash – For those individuals who prefer a body wash for acne compared to a bar soap, then give this product a try. This product is designed to treat and heal acne blemishes on the body, including the face, shoulders, back and chest. It helps to unclog pores, prevent whiteheads and blackheads as well as future breakouts. The unique formula also helps to dissolve dead skin cells, giving you clean, clear, and smoother skin appearance. One of the best parts about using Proactiv body wash for acne products is that it doesn’t leave users with that tight or dry feeling after use. Proactiv is one of the leading acne wash products designed to treat and even cure acne. However, the Proactiv acne fighting system can be expensive. The Proactiv Deep Cleansing Wash for Acne can be purchased for $40 online. Clean and Clear Advantage Acne Spot Treatment – Clean and Clear wins again for being one of the top-rated acne spot treatment products. This product has proven to help reduce the visible signs of acne, blemishes, and also works to gently clean pores, cleanse skin, and promote a bright and smooth appearance. This product is best for normal, oily, and combination skin types. It contains 2 percent salicylic acid, making it an effective acne spot treatment medication. Manufacturers recommend using at least once daily for maximum and fastest results. Manufacturers also recommend combining this product with Clean and Clear deep cleanser for best results. Clean and Clear Acne Spot Treatment can be purchased online and in stores for approximately $5 to $10. All in all, acne isn’t fun to deal with. It can be frustrating and embarrassing to say the least, especially if you are well into adulthood. Although there are a number of expensive acne treatments available, there are also a number of over-the-counter products designed with the necessary chemical solutions to help combat against acne breakouts, treat acne-prone skin, and even prevent future breakouts and finally treat adult acne for good.